Tofino Sea Kayaking, the iconic waterfront kayaking centre, bookstore and coffee bar, has teamed up with Edible Canada to offer a variety of high quality culinary products to Tofino residents and visitors to the popular Vancouver Island destination. Tofino Sea Kayaking will feature the top 50 products sold through Edible Canada’s busy retail store on Granville Island – a vibrant space with hundreds of personally sourced and tasted items from culinary artisans coast to coast. Items include Vista D’oro heritage preserves from Langley; Noble Maple, Bourbon and Tahitian Vanilla Syrups from Quebec; and Cocolico sweets and sauces from Vancouver. 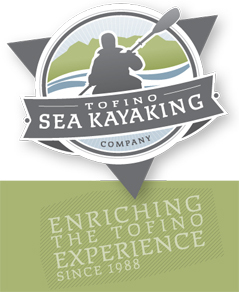 Founded in 1987 and housed in an historical building on the Tofino waterfront at the gateway to Clayoquot Sound, the Tofino Sea Kayaking Centre is the premiere source of kayaking expertise, local knowledge and tastefully selected products to enhance the active, curious traveller’s experience. Edible Canada (formerly Edible British Columbia) is a six year-old business headquartered at Granville Island Public Market, in Vancouver, British Columbia. We are Canada’s largest culinary tourism and locavore retail company, dedicated to sourcing the highest quality culinary products from coast to coast for our customers. Services include our retail & online artisan food store, chef guided Granville Island Market Tours, demonstration guest chef Market Dinners, Gourmet Kayaking Weekends, and popular Amuse Bouche newsletter and blog. In the summer of 2011 we opened Edible Canada at the Market — a vibrant bistro in the heart of Granville Island and at the forefront of Canadian cuisine.